These fries! The perfect compromise when BL asks me to make snacks for the game on Sunday, while not feeling like we’re just eating chips and dip for dinner. These loaded sweet potato fries were inspired by my Mediterranean stuffed potatoes, a dish that’s almost exactly the same thing. 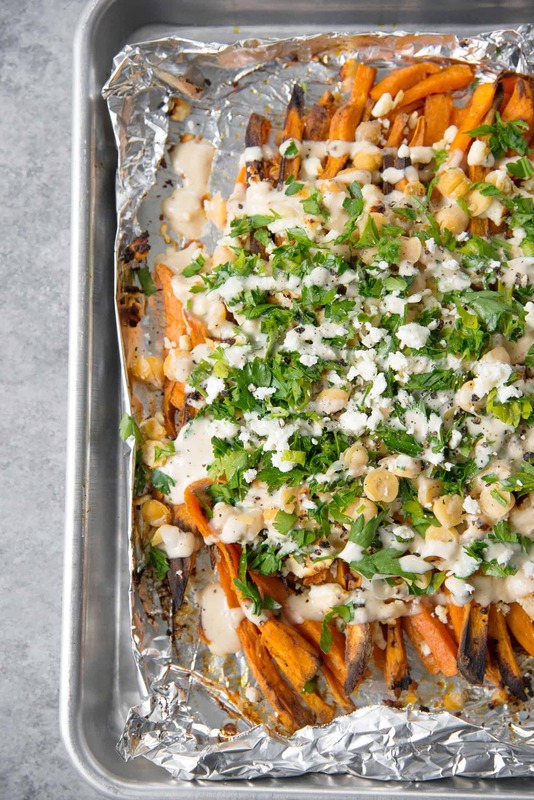 Sweet potato with lots of herbs, chickpeas and a dreamy tahini sauce. While I still love the idea of baking and stuffing a giant sweet potato, there’s something a lot more fun about making sweet potato fries instead. So, that’s exactly what we are going to do. These are messy fries. Gloriously, messy fries! I call them nachos, but you’re going to eat these with a fork. I put them on a tray like the one below to serve to a crowd– or just BL and I. The secret to these crispy sweet potato fries is cutting them as uniformly as possible. That way they all cook at an even rate. You may have a few small guys on the end that burn, but the majority should be crispy. Keep an eye on them, pulling them when they have a nice crust on them. I find that most people pull fries when the potatoes are cooked through and tender, but you want to cook these longer. The other trick is making sure you are putting the sweet potatoes in a single layer- using 2-3 baking sheets if needed. If they are stacked one on top of another, they will steam– not crisp. I like throwing a little bit of starch onto the potatoes before cooking as it helps them get nice and crispy. I call for cornstarch here, but arrowroot starch will also work. Monday’s are hard enough, how about fries for dinner? 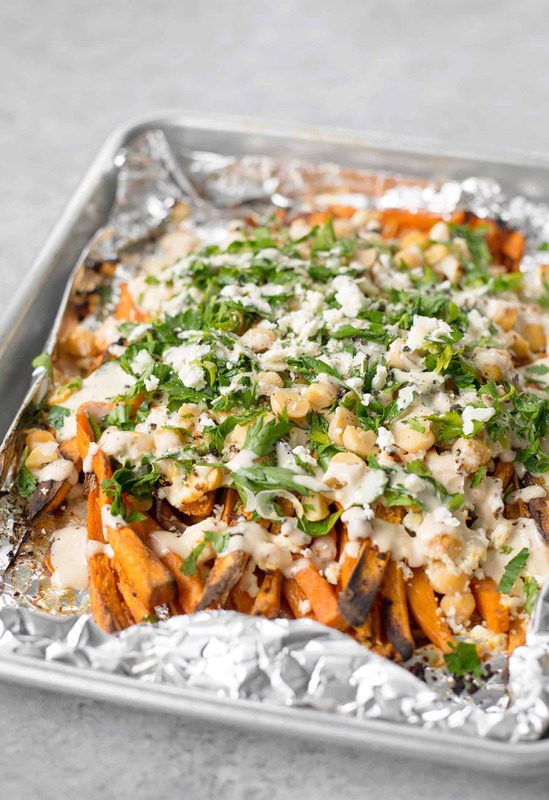 Loaded Sweet Potato Greek Fries! 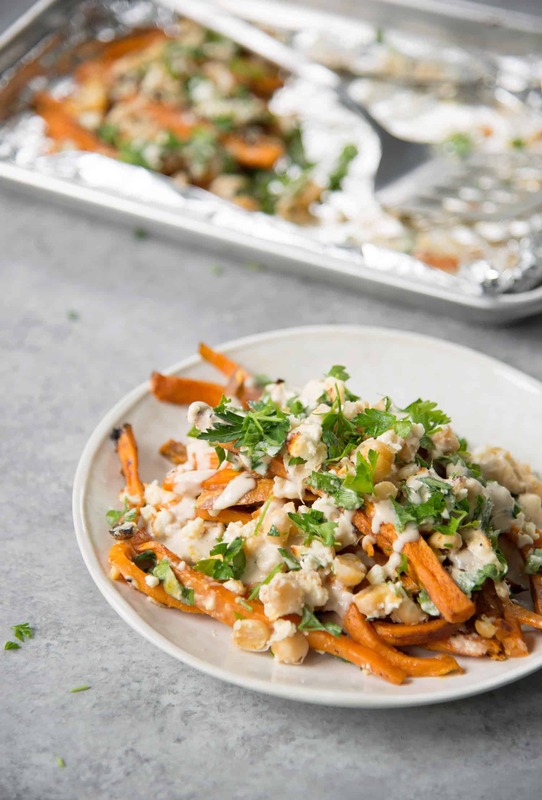 Crispy sweet potato fries with feta, chickpeas, parsley and a lemon-tahini sauce. Vegetarian and gluten-free. Make the lemon-tahini sauce. Add the tahini, water, lemon juice, garlic, cumin, cayenne, and salt to a blender or food processor and blend until creamy and smooth. The mixture should be the consistency of ranch dressing; if it’s too thick, add a bit more water. While you don’t have to use a blender or food processor, it’ll make it much easier to blend everything together. Season to taste for salt/spices and set aside. Preheat the oven to 425 degrees Fahrenheit. Peel the sweet potatoes and cut them into even, fry-shaped pieces. Ideally, you want the potatoes to be as similar in size as possible for even cooking. Place fries in a large bowl (or large plastic bag for easy shaking) and sprinkle with cornstarch to evenly coat. Add in the olive oil and spices, then mix or shake to evenly cover. 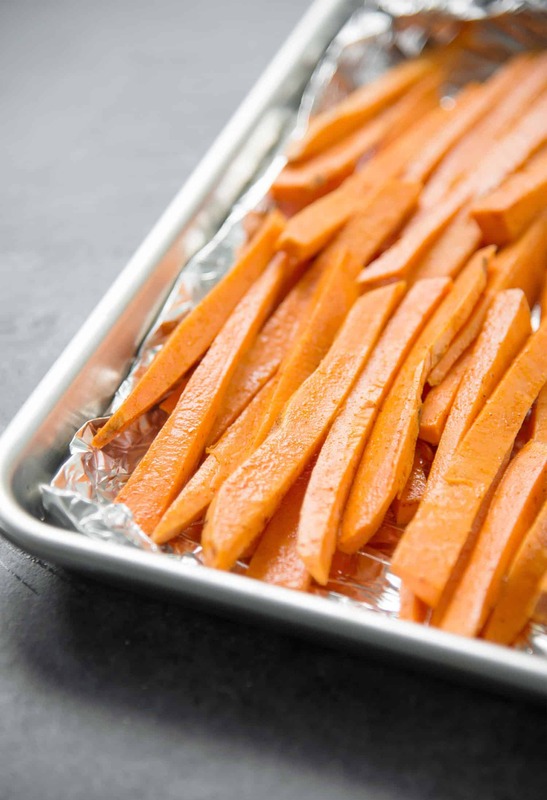 Place fries in a single layer on a non-stick baking sheet (they need to be in a single layer so they crispy and don’t steam). Depending on how large your baking sheet is, you may need two sheets. Bake for 15 minutes, then toss and bake another 10-15 minutes until crispy and cooked through. Remove from oven and drizzle with tahini sauce. Sprinkle with feta, chickpeas and parsley, then serve. These are messy and delicious! Serve them on a plate with a fork for easy eating.